For the second consecutive year, Loyola Blakefield’s nationally recognized Cyber Science Initiative (CSI) has qualified a team as a finalist in the national championship round of the Air Force Association's (AFA) CyberPatriot—The National Youth Cyber Defense Competition. Loyola is one of just 12 teams to advance from a pool of more than 2,200 Open Division teams. The competition began with qualification rounds in October, starting with more than 20,000 students representing 4,404 teams from the U.S. and Canada. After five months of intense competition, the final 12 teams will meet in Baltimore during the first week of April to compete for the national title. 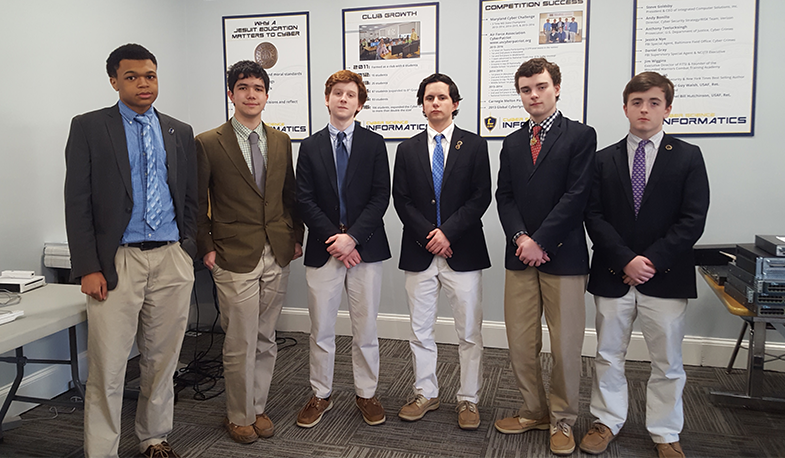 Loyola’s “Team Cerulean” is comprised of the following students: Henry Ballentine ‘18, Colin Bowes ’18, Jack Connolly ‘18, Matt Hawkins ’18, Henry Mackay ’20, and Ainsley O’Garro ’18. The final 12 teams will compete to defend virtual networks and mobile devices from a professional aggressor team. They will also face off in three additional competition components: the Facebook Challenge, the Cisco Networking Challenge, and the Leidos Digital Forensics Challenge. These extra challenges will expose competitors to new elements and skillsets of the many career opportunities available to them. Additionally, Loyola’s middle school team, Micro Dons, finished first in the state of Maryland and 4th place nationally out of 580 teams. Members of the team include Will Erdman ‘21, Matt Fleschner ‘21, Graham Goldsborough ‘21, Jack Klug ‘21, Julian Javillo ’21, and Sean Reiners ’21. Overall, there were 13 total teams participating from Loyola this year and all finished in the top 6% in the country. Loyola is the only non-technical/non-public magnet school to qualify a team in the national finals.